Tesco says 1,000 people are to be made redundant as part of a shake-up of its distribution network. The company says the changes form part of a wider programme of transformation, which has been taking place over the last two years. The proposed changes will reduce the number of Tesco distribution centres from 25 to 23 in the UK. 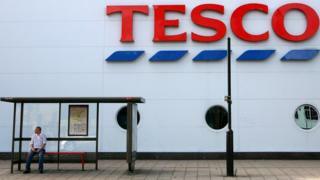 However, Tesco said it expected to create 500 jobs as part of the changes, which should be in place by June. The announcement comes as Tesco prepares to issue a trading statement on Thursday that will give details of its retail performance over the Christmas period. Like its main High Street rivals - Sainsbury's, Asda and Morrisons - the supermarket chain has been struggling to maintain market share in the face of competition from German discounters Aldi and Lidl. Rising inflation fuelled by the pound's weakness since the Brexit referendum is also expected to exacerbate problems for the Big Four supermarkets, as imported products become more expensive when priced in sterling. However, analysts are forecasting a rise in sales over the Christmas trading period. The revamp of Tesco's logistics involves the closure of the Welham Green, Hertfordshire, and Chesterfield distribution centres. Welham Green's grocery operations will move to the Reading distribution centre, while the majority of general merchandising will move into one distribution centre at Middlesbrough. Tesco is also withdrawing from a warehouse shared with logistics firm DHL in Daventry, Northamptonshire. Clothing operations there will move to the nearby Tesco Daventry distribution centre. Retail analyst Steve Dresser tweeted that the plan was "a risk". "One has to hope it's not cost-driven and is naturally occurring, given their better operation in stores," he said. "Taking away depots and logistics flexibility whilst also taking store night-fill away could leave things very tight indeed."